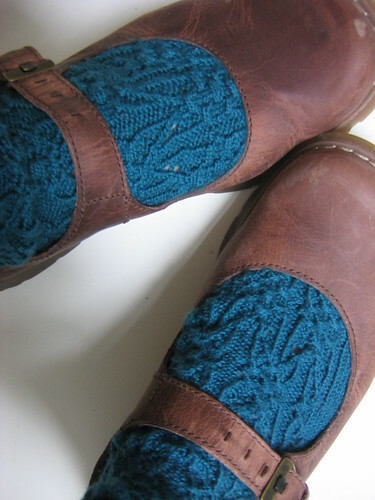 This is a post in praise of the knit blog. Its inspired by the 'You Make My Day' award which has been doing the rounds, and Veronique and Emma both presented me with tags for. But I'll start with an FO post - its been waiting to be blogged for a while, and is (kind of) on topic. I only made one of these. As part of a 'single sock swap', Kate (of Zeitgeist) did half the work. Plus she chose the pattern and complementing yarn, which is, after-all, a big part of any decent FO. I'd made this sock for Heather (ADD Knitter), and sent it to her with enough yarn and the pattern to make its pair; Kate did similar for me. Isn't that the best idea for a swap, possibly ever? Needles: 2mm & 2.5mm knit-picks circs. Pattern: Gothic Spire, by Cookie A. Shoes: Doc Martin's Mary-Janes, purchased in the winter sales. I loved knitting this. Not just because of Cookie’s pattern, or the soft and gleaming yarn, but also the Kate's notes on how to accurately replicate her first sock. I always feel knitting from a pattern (as opposed to designing your own) is an insight into another knitter’s approach. I often learn techniques from following patterns. This time, I had the added bonus of an insight into how the pattern was read by another knitter. So, the 'You Make My Day' awards. Rules: Give the award to 10 people whose blogs make you feel happy about blogland, then let them know so they can pass it on. It was so hard! I limited myself to knitter-bloggers, but still my first draft was about thirty. But here are the final ten, and why, in alphabetical order. 1) A Mingled Yarn. Elizabeth churns out sweaters at the most amazing speed. She thinks about them too; chooses good patterns and pairs them with appropriate mods to produce perfect FOs. She is also a big inspriation on me to sew and I enjoy her more literary posts. A well thought out, well organised and often inspiring blog. 2) Dogged. Funny, observant and thoughtful posts. Gorgeous photographs, with an amazing warmth to them. 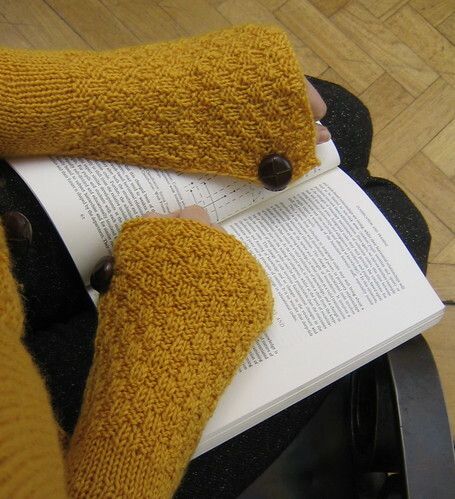 I really like the ways she reflects not only on knitting, but knit bloggers and their trends. Plus I enjoy drooling over her quilting skills. 3) HelloYarn. In one word, inspiring. Gorgeous shots of knitting and yarn, produced with a great sense of colour, immense skill, an obvious delight in a knitting challenge and a beautifully subversive style. Fair-isle insects, you can't get much cooler than that. Adrian is also one of the most knowledgeable knitters blogging, and one of the many that inspire me to challenge myself to try new techniques. 4) Knitting Philistine. Megan's another one with incredible, fiberlicious, camera-skills. 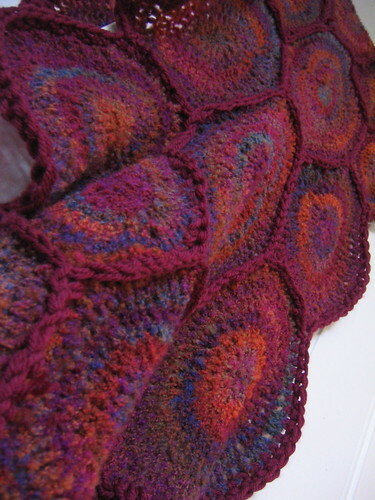 She has a great eye for choosing patterns and yarn, and writes with a lovely breezy style. She's also one of the (many) grad-school knit-bloggers I read. I especially enjoy the enthusiasm she puts into her knitting, photography and blog. It's enthusiasm with a good dose of sardonic humour, but that's my favourite flavour. A real celebration of knitting, without getting 'too twee with the squee'. 5) Needled. Kate composes relatively long posts, but beautifully crafted ones, on a range of design and material culture issues. Funny, extraordinarily skilled, and most of all intelligent. Always worth the read. 6) Practical Polly. Perhaps its crazy to include the blog of someone you share a flat with. Kirsty often says she doesn't bother reading my blog because she assumes I'd tell her anything noteworthy. I read Practical Polly though *screws up face and blows raspberry at rude friend*. I enjoy seeing what aspects of her life she'll choose to blog about. Also, Kirsty has a large part of her knitting life based in Oxford, so it happens outside of our shared space. And through this I have an odd, virtual connection with her knit group, the Bluestockings. I read a load of their blogs too, so I'm going to cheat and add them along with Kirsty. 7) Quelle Erqsome. I read this in a completely different way from (for example) Needled, as Emma's blogging style is more about providing frequent, intense hits of her irreverent humour, great photos, forthright views and superb links. Plus, I like that she's a Londoner academic, even if I fail to go to any local knitting groups and so haven't met her in person. A speedy, punchy blog, but not a frivolous one; it can stay with you for a while afterwards. 8) Specs. Funny, thoughtful, self-deprecating and honest posts, lovely knitting and nice photos. 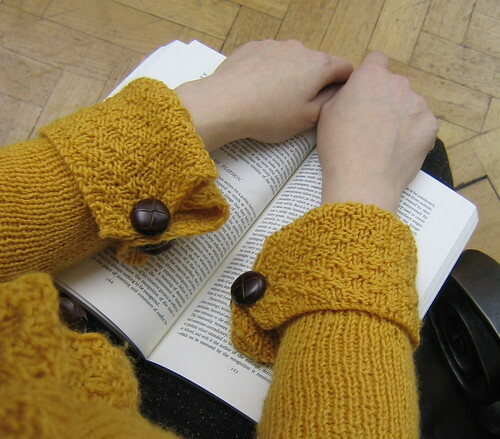 What more could you wish for in a knit-blogger? 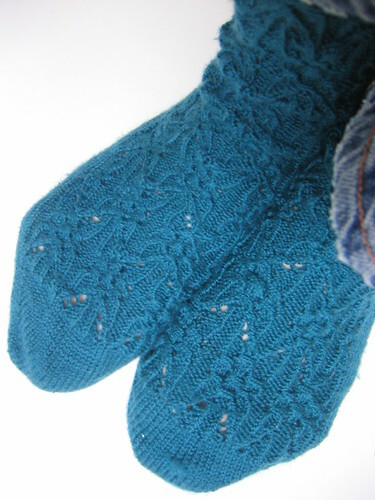 I first started reading Sarah's blog when she commented here while knitting one of my patterns. 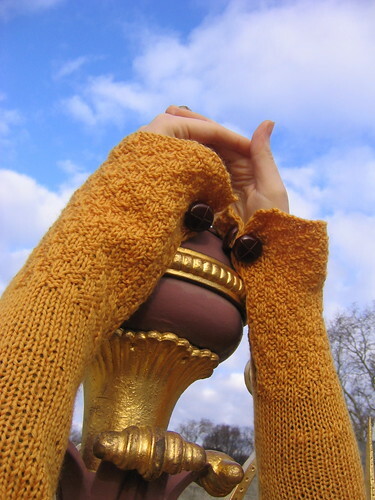 It's one of the nicest ways I've 'met' knit-bloggers, and my blogroll is full of such links. 9) Tres Chic, Veronique. Great FOs, clear technical skills, pretty photos and an obvious enjoyment of knitter's maths. Plus, she's another knitter who inspires me to sew. I 'met' Veronique through a run of secret pal, and been a fan of her blog ever since. When I was briefly in New York this winter I even managed to meet her in person. I had assumed she'd have a French accent - not the case at all - I bet there are loads of other bits and pieces I've accidentally 'coloured in' about the lives of the bloggers I read. As with Kirsty and the bluestockings, I'm going to cheat again and include the rest of the Spiders with her, as I'm an avid reader of nearly all their blogs too. It was really nice to meet Gleek (and the Peanut!) in NYC too. 10) Ysolda. I don't know how she finds the time for so much knitting, designing and other domestic gubbins, but its all oodles of fun to read about. She writes well and the photos always look so very good. Plus I like that she's in Edinburgh, it reminds me of my Scottish roots. A classy blog from a clever and creative young woman. Mary pointed me to a mistake in the cardigan pattern. It wasn't a big one. I think it was bad maths, or a typo. Or perhaps both. Either way, I apologise. But when you check a pattern you have to pull it right back to first principles to work out exactly where the problem is (at least I do). And this pulling-back made me rethink some of the arm/ body ratio spacing, which has led to a bigger change. (RS) Work 10 sts in pattern and hold these on a large safety pin, change to size 5 needles, k12 [13, 14, 15, 16, 17, 18, 19, 20], pm, k14 [16, 18, 20, 22, 24, 26, 28, 30], pm, k36 [38, 40, 42, 44, 46, 48, 50, 52], pm, k14 [16, 18, 20, 22, 24, 26, 28, 30], pm, k12 [13, 14, 15, 16, 17, 18, 19, 20], pm, hold the remaining 10 sts on a safety pin. I know at least six people have started because Ravelry told me so. If you have cast-on and got passed the neckband already, the original measurements should still be fine. There were very few places where the maths actually didn't work, and where I have changed things it's normally just by a stitch or two. Its only for the very large sizes that I've changed anything of note. Remember that it is a top-down raglan, so you can try it on to make it fit you as you go anyway. 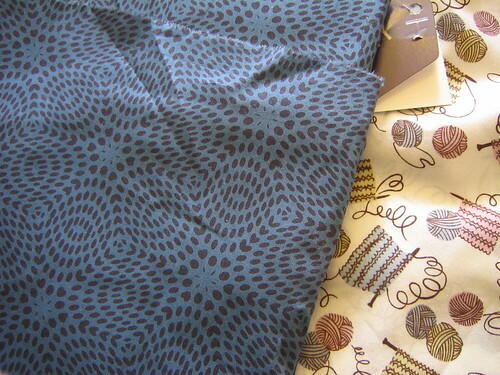 So as not to have a totally photo-less post, here's a shot of some fabric I bought in the Liberty sale. Look, knitting fabric! They actually had it in three different colourways. I was quite restrained at that fabric sale; they also had all sorts of cool prints of girl scouts camping, sixties swirls filled with fairy-tale characters... I swear I star-spotted Kaffe Fasset there too (see how I cunningly distract you from my bad mental arithmetic?). Brompton's queue is at 66 last time I checked, and one person's cast on already. How did that happen? I had no idea I had that kind of blog traffic. Sometimes I think the online knitting community is largley about imaginary knitting (fantasy knitting, like fantasy football...? ), and I suspect ravelry's queuing feature encouredges that. All that said, thanks. Really, I mean that. For the ravelry comments, ravelry faves (got to love those hearts scattered over your profile), blog comments, links, emails... I'm actually very, very touched. 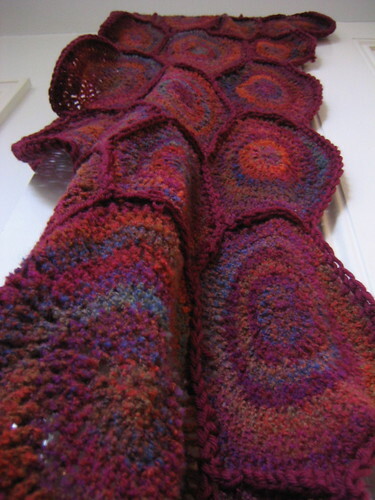 Plus this sort of thing always brings lurkers out; I've discovered a load of new knitters. I'm going to look into putting up the pattern in ravlery as a download pdf, but that'll take time I don't have right now. I will look into it though. I have no knitting content, as it is still rainy and horrible and I have failed to take any decent photos. Plus I've been applying for jobs and writing papers instead of knitting this week. So I'll end this with a tip and a link. Tip: Put potato water in your homemade bread. Even better, mash up a couple of potatoes and put that in your dough. It's amazing; the fluffiest center, with a lovely chewy-yet-crisp crust. The sort of bread that is made for strawberry jam. Freezes beautifully and the toast is divine. You might think I'm crazy, it's a Nigella tip I ignored for years as simply loopy, but it works wonders. If you have her domestic goddess book, its page 298 of the UK hardback (though don't use nearly as much salt as she says, in that respect she is loopy). Link: Hadley Freeman on "Granny Chic". She complains that the recent vogue for an "eccentric trendiness" (cabled cardigans, tweed skirts and the like) isn't pretty and isn't fun. I disagree with her in terms of taste (it is very pretty, and oodles of fun), but otherwise I thought the article was spot-on. However, she's missing a trick in ignoring the number of blokes who have taken on the same aesthetic - have you seen the quantity of 1970s OU beards in your average urban bar these days? (or is that just a Hackney/ Dulwich thing?) I also suspect this aesthetic reaches to taste in food, drink and hobbies. I'd be interested to know what other knitters think about the article though. I suspect a fair few of us engage in a bit of granny-chic. Personally, I appear to be wearing two types of tweed today, which I admit is excessive. I'm a big cardigan wearer - party because I enjoy conforming to the academic cliché, but also because they are so convenient for layering warmth and letting your Summer/ Autumn wardrobe extend into colder months. The ultimate transition garment. A few months ago I started to have a hankering for a yellow, dk-weight cardigan. I had an idea for a perfect garment in my head, but it was very vague and, probably because my standards were so high, I kept changing my mind. I cast on for a top-down raglan. Then bottom-up with set-in sleeves, then top-down again with a different design. I played with cable, lace, cable again, frogging and re-knitting just to frog again. Kirsty still hasn't stopped teasing me about how many times this thing was knitted. Eventually, I settled on a simple top-down raglan with a basketweave boarder, a bit of side shaping, slipped stitch edges, an applied button band and double-sided sleeves you can wear up (for working) or down (to keep hands snuggly warm). I had thought about submitting it to knitty, but the deadline day came and we didn't have internet access. Plus the light's been rubbish and I didn't feel there were good enough photos. Most of all I felt that, for all the pattern's finishing touches, the design was too simple. Basic patterns on knitty annoy me, I figured why add to it? I have the pattern written up though, so I'll post it here if anyone interested. Yarn: cygnet superwash double-knit wool in 'gold', 8 balls. Needles: 3.25mm circ, 3.75 circ (both 80cm). Buttons: 11 of the big brown ones (from Liberty, 75p each... but worth it) and 7 smaller ones to stabilise them (from John Lewis, in a pre-packed box - these are cheap plastic basic buttons for mending your trousers). This last picture was taken at my very favourite part of London; the Science and Art staircase the Victoria and Albert Museum. Not many people realise, but the Science Museum used to be inside the V&A building, back when it was simply the 'South Kensington Museum' and basically the left-overs from the 1851 Great Exhibition. The science collections were booted out to the west side of the stree around the turn of the century; the main exteriour of the V&A built around the old duel-use building. So although the outside of the building is overtly arts and crafts, you'll find a more mixed set of iconography in the interiour. The art and science sections were connected (and demarcated from one another) with a gorgeous ceramic staircase covered in the letters 'S' and 'A'. The V&A, conscious that their own building is one of the prize pieces of their collection, maintain this staircase, but I think most visitors today just walk through it, perhaps thinking its particularly pretty, maybe wondering why Galileo's name is worked into the design. So, what was I doing with all those spirals? I was making a blanket. In the end, I made 42 spirals*. Then I laid them out on the kitchen table, pinned them and linked it all together with a boarder made of a deep-red wool. The MC is a variegated boucle I bought at Avril in Japan (don't ask any more details - I don't have them and when I did they were in Japanese), the CC is Rowan's pure wool aran (with the disturbing colourway-name of "blood"). I used a mix of 4.5mm and 6mm hooks. I then spent several evenings weaving in ends. This is the key problem with crochet blankets. It was one of the Christmas presents for my mother, which is why I've kept it secret so far. She turned 60 this year, so I thought an (ironic) "old lady blanket" would be a good idea; the crochet spirals are meant to be a twist on the traditional granny square. Because she's no square, she's my momma (plus, neither me or my brother aim to make her a granny for a while). 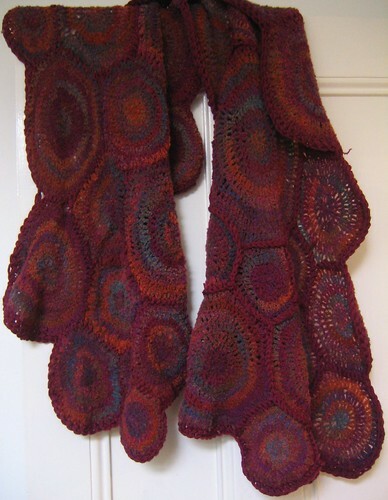 It's based on one of my favourite scarves, which itself is inspired by some of Ruth's amazing hat creations. I was aiming for a lap blanket, but I realised I didn't quite have enough of the spirals to cover the required area and I didn't want to space them out with too-large a red boarder. So instead I plumped for a giant wrap. As it turns out, Mum seems to find the extra warmth around the shoulders really good, and she's been wearing it loads while she works from home. This picture gives an idea of how it hangs over the shoulders (and a clue as to scale). Plus, apparently it reminds her of a bed jacket her mother made her years ago. One of the unexpected outcomes of my adventures in yarn is it reminds mum of her own mother. She loves saying "I dreaded that thing about turning into my mother, turns out my daughter did it for me" and I enjoy haunting/ poking fun at her with it. It's that odd thing about being the kid of 50s/60s teenagers. They rebelled against their parents and made a big fuss of it. So do we follow them in such rebellion (which, if you think about it, isn't really that rebellious, as you're doing what they did), or find other ways of bugging them, like aping their parents? The delights of postmodern generational relations. That said, it probably isn't just a matter of post/late/ liquid modenity; it's not as if notions of revolutionary generational change are especially new. Still, its nice how craft often weaves links accross time, whilst allowing generations their own take on things (as evidenced by book titles like this). I wonder what my Granny would have thought of Ravelry? * This number wasn't deliberate, but I'm a geek so it pleased me. Another vintage FO that has so-far been hidden from the internet (squirrelled away as a secret Christmas present). Space invader socks, made for my little brother. Completed late this summer during flights to and from Tokyo. 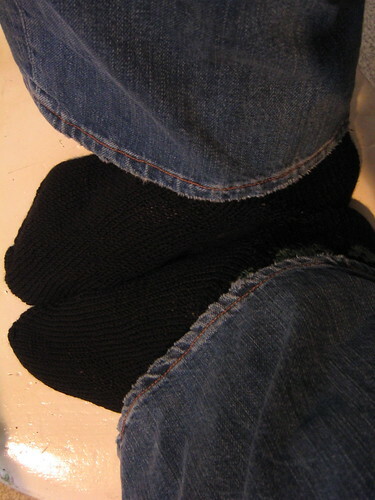 I had an idea for these socks ages ago. But great minds think alike and Aija produced her great pattern last Spring. I thought I might as well use her specifications as they were much nicer than the vague idea I had half-formed. However, my (bamboo, 2mm) needle snapped a few cm into the charts. As I was on an aeroplane somewhere over Russia at the time, I was limited to the only other needle in my hand luggage, which happened to be a size up. So, I re-gauged and in doing so had to enlarge and simplify the pattern a bit. 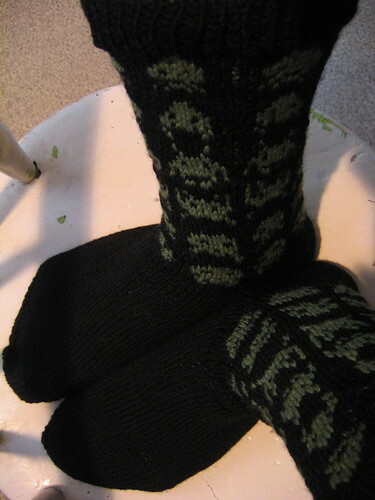 Still, the bigger space invaders show up neatly, and the looser tension means the socks are slightly stretchier. As with the pirate argyles I made my brother last year, these are a pair of socks that are quite silly, but can look respectable under a suit. Let your trousers sit naturally and the embarrassing big-sister knitted motifs entirely disappear: lift them up a few cm and your childish alter-ego is revealed (though you might spot a green monster poking through the left foot on this photo). The yarn is matchmaker 4ply for the black and knitpicks essential for the green (grass colourway), for those who wonder about such things. And I ended up using a 2.5mmm 80cm addi circular, toe up method.